Always hold the triangle between the music and conductor where you can see both without moving your head. Experiment with different playing areas-and the amount of beater surface-to get the optimal sound for the specific passage. Experiment with different triangles to get the optimal sound for the specific passages. 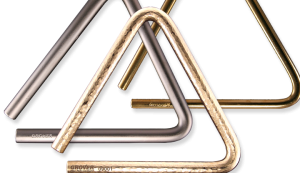 Big triangles don’t have to be played for only loud passages (same for cymbals). Don’t be afraid to use a heavier beater for softer playing. You’ll hear a big difference! Try not to change the location of the triangle if playing rolling and rhythmic passage together (some players prefer to roll with the triangle lower so as to not raise the arm). This changes the sound-as a tambourine especially does, but not as drastic. For rhythmic passages, strive to get the same exact sound for every single note. Muffle as needed with opposite hand’s ring and pinky fingers (remove wedding ring if need be). Experiment with how much muffling is appropriate. For fast, rhythmic passages, slight muffling throughout could work well. Chris DeChiara, a native of Burlington, Mass., joined the Navy Band in 2001. He earned a Bachelor of Music from the University of Massachusetts, Lowell in 1997 and a Master of Music with academic honors from New England Conservatory, both in percussion performance. While at Lowell, he was section leader of the drumline and a guest conductor/director with the university’s percussion ensemble. In 1994, he marched with the Boston Crusaders Drum and Bugle Corps. He has written for Modern Drummer magazine, and has performed with the Boston Ballet, Boston Lyric Opera, Kennedy Center Ballet, Rhode Island Philharmonic, Lake George Opera, Alexandria Symphony, Arlington Symphony, McLean Symphony, and the United World Philharmonic in Bonn, Germany. He has also appeared with the Rome Festival Orchestra, and performed at the Aspen, Schleswig-Holstein, and Spoleto Music Festivals with conductors James Conlon, Christoph Eschenbach, Mstilav Rostropovich, Sergiu Commissiona, Julius Rudell, Stanislav Skrowaczewski, and Keith Lockhart. He has been featured on WGBH radio, Boston, ZDF and ARTE French and German Television, and appears on the premiere recordings of Shirish Korde’s Drowned Woman of the Sky and Kurt Weill’s opera, Die Burgshaft on EMI Records. His teachers include Jeff Fischer, Fred Buda, and Will Hudgins of the Boston Symphony Orchestra.